The next generation of on-road performance has arrived with the Speed R2103 from O.S.! Capable of a wider range of torque than the R2102, the Speed R2103 dominates even on high-grip surfaces. Superior fuel consumption ensures you get the most mileage from every fill-up. Factory-applied two-color graphics add signature style to this sleek-looking power plant. 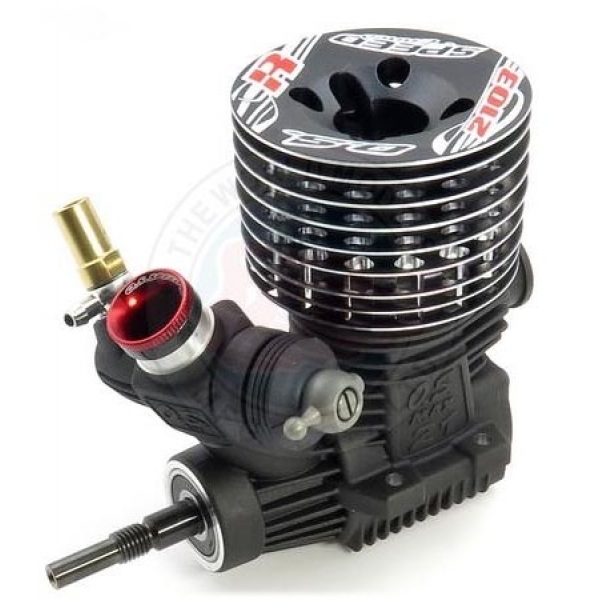 Compatible with 16% nitro fuel, which complies with EFRA regulations. Crankshaft with Diamond-Like Coating (DLC) and an embedded tungsten weight. Outer head with factory-applied two-color graphics. Inner button head allows for finer tuning to meet track conditions. 8.5 mm reducer installed in the carburetor venturi to reduce the amount of airflow for greater torque. Includes exhaust seal ring, tapered collet and three carb dust seal caps. Also available with the T-2080SC Pipe Set, constructed of polished aluminum and tuned for competition.